It's a-them, the Mario Brothers, coming a screen near you! 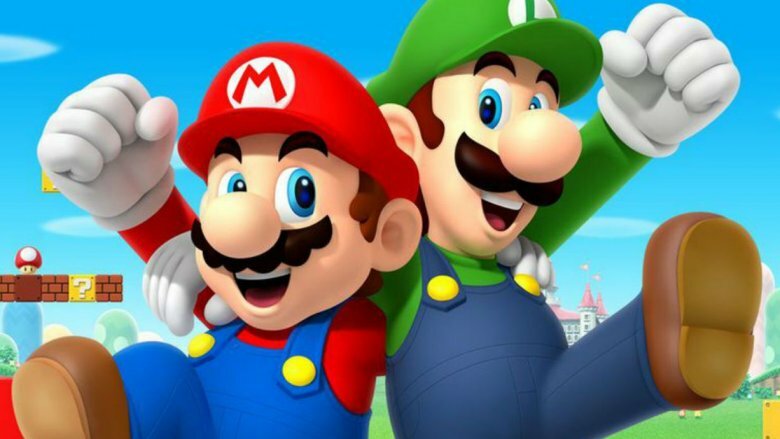 Illumination Entertainment founder and standing CEO Chris Meledandri has confirmed that an animated Super Mario Bros. movie is officially in the works. Looper previously reported in November 2017 that Illumination was nearing a deal with Nintendo to create the game-to-movie adaptation, and again in January 2018 that the agreement had been finalized. Now, the Super Mario Bros. film is in "priority development" at Illumination. Meledandri — who's also known in Hollywood as the guy who has produced dozens of animated films like Minions, Despicable Me, and The Secret Life of Pets – made the announcement when speaking with Variety, sharing his excitement about translating the iconic Nintendo game to film and hopefully making up for the 1993 Super Mario Bros. movie that was castigated by critics and roasted by fans. "I like that this was not done well the first time," said Meledandri, who views the pressure to deliver a strong Super Mario Bros. movie as a thrilling challenge rather than a burden that may break him. "I think that's more exciting or more worthy than simply making another version of a film that was done incredibly well to begin with." Nintendo luminary Shigeru Miyamoto — who designed and produced the original Super Mario Bros. title from 1985, as well as various installments in the games company's Donkey Kong, F-Zero, Mario, Star Fox, The Legend of Zelda, and Pimkin franchises – will be heavily involved in the making of Illumination's Super Mario Bros. movie. Meledandri stated that he feels the minds behind the '90s venture — namely directors Rocky Morton and Annabel Jankel and screenwriters Jim Jennewein, Tom S. Parker, Barry Morrow, Parker Bennett, Terry Runte, and Ed Solomon — made a grave mistake in not partnering up with Miyamoto during the development process. Illumination surely won't commit the same error. "We are keeping him front and center in the creation of this film. I've rarely seen that happen with any adaptation where the original creative voice is being embraced like we're embracing Miyamoto," Meledrandri noted. "There's a history in Hollywood of people believing that they know better than the people responsible for a property. I've made that mistake before." If you're already thinking about how huge an undertaking it is to develop a film based on one of the most well-known video games of all time, and worrying whether Illumination can deliver, you're not alone. Meledandri knows exactly how "ambitious" the task is, and admitted as much to Variety, but doesn't seem shaken by the endeavor. "The challenge is taking things that are so thin in their original form and finding depth that doesn't compromise what generations of fans love about Mario, but also feels organic to the iconography and can support a three-act structure," he said. News that Meledandri and the brass at Illumination are making a Super Mario Bros. movie comes hot off the heels of the announcement that he and the company are rebooting Shrek and Puss in Boots. Meledandri and co. are obviously confident in their abilities to bring popular properties to the big screen, and judging by the CEO's statements here, he's thought long and hard about everything required to not just make a Super Mario Bros. film but make a good Super Mario Bros. film. Since the project is still in the very early stages of development, it has no director, writer, or release date attached to it just yet. As of this writing, though, the plan is to roll out the Super Mario Bros. movie either before 2022 or sometime during that year.